Last week, we invited some friends over for an evening campfire and s’mores. 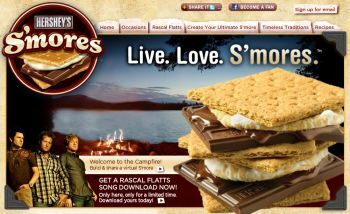 Everyone knows s’mores: graham crackers (blech), marshmallows (okay, getting better), and Hershey’s chocolate bars (yes! give me some). I bought the biggest, thickest Hershey’s bar I could find. I think it weighed 4.2 pounds (1.91kg). Hershey’s is a smart company, and they know that anyone who has one of their smooth, delicious chocolate bars will be forced (by arm twisting and occasional use of The Rack) to share. For this reason, they mold their chocolate bars into an interesting collection of “mini bars” joined together by “connective chocolate.” The connective chocolate is an ambiguous gray zone that can never be divided equally. By the strictest rules of chocolate etiquette, the person entrusted with breaking the bar into its mini bar pieces must place uniform pressure on each mini bar and attempt to break them into pieces that differ by no more than .001mm in size. Most people cheat. Have you ever taken a bite out of a candy bar and thought â€œThis is so wrong!â€ Do you feel that your love for all things candy is not adequately represented in any product on the market? Is there just a brilliant candy bar buried in your mind that your just waiting to see materialize one day? If you, like me, answered yes to those questions, then you will understand why I am undergoing a process of creating my own candy bar. All too many times I have been disappointed by hollow promises of candy wrappers beguiling me into purchasing bad candy. No more excuses! I have decided to make my own bar so that way I control the quality of ingredients and make sure there is nothing in it that I donâ€™t want. Seeking inspiration for this bar, I turned to the month. August. Wellâ€¦ here in Austin, TX, itâ€™s incredibly hot and humid, but thatâ€™s summer for you. And what says summer like going out into the woods and camping? And can you really camp anywhere without making sâ€™mores? So in honor of all things woodsy and sâ€™mores-related, I have concocted an inverted sâ€™mores black forest bar that I call Lost in the Woods. Iâ€™m not really a big fan of numbers. Or science. Or instruction manuals, for that matter. So I donâ€™t really know if all the specs work out. But I do enjoy t-shirts. And I love sâ€™mores. And since my affinity for the latter outweighs my disdain for the former at a ratio of exactly 7652:1 (did I do that right? Like I said, Iâ€™m really more for the candy than the math) I feel that puts me in the clear to adore this S’mores how-to shirt from Threadless. My only concern? I have always â€“ always â€“ constructed my sâ€™mores with the marshmallow on top of the chocolate square. Have they changed the rules since I took Sâ€™more 101? â€˜Cause I gotta tell ya, I donâ€™t know that Iâ€™m willing to change. Itâ€™s pretty perfect that way. 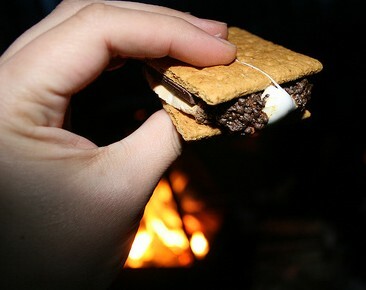 Despite this flaw, however, I am looking forward to the â€œmore detailed instructionsâ€ promised to follow in Sâ€™more 201. Do you think that includes the introduction of additional ingredients? Because a thin layer of peanut butter spread beneath Graham Cracker Sheet #1 makes for an awesome advanced sâ€™more.